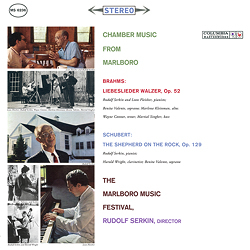 "Chamber Music From Marlboro" Johannes Brahms: "Liebeslieder-Walzer" op. 52 / Franz Schubert: "The Shepard On The Rock" D 965 - Rudolf Serkin (p, dir); Leon Fleisher (p); Harold Wright (cl); Benita Valente (soprano); a.o. ﻿The waltz was perhaps the most important thing that the rather level-headed and conservative Johannes Brahms from Hamburg brought back with him from his sojourn in Vienna. In addition to his purely instrumental waltzes for the piano, he also composed the "Liebeslieder Waltzes" – uniquely folk like and highly original vocal joyfulness in ¾ time. The lyrics are taken from real life and tell of love, longing, desire, and suffering but also of anger and derision. Just how ideally this music fits in with the workshop atmosphere of the Marlboro Summer Music Festival is fully evident here. The musicians gathered around Rudolf Serkin sing the very finest Brahms – joyous, inspired yet completely relaxed – and reflect light upon all aspects of earthly existence. An excellent choice to complement these emotions is Schubert’s penultimate composition "The Shepherd On The Rock" D 965. This great and far-too-seldom performed lied is based on three poems, which are performed impressively and with brilliant musicality by the soloist Benita Valente. And last but not least, the addition of the clarinet, which functions both as a soloist as well as imitating the voice, lends the work its particular charm.